The issue of “religious eduction” in our school system is a complex subject. For many it is also a very emotional and personal matter. Jewel Topsfield, the Education Editor at The Age wrote a provocative piece that blended her own views and experiences with factual information about FIRIS, the school system and the nature of the issue being discussed. 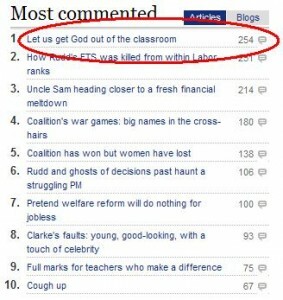 The first thing to point out about this article is how many comments it received. 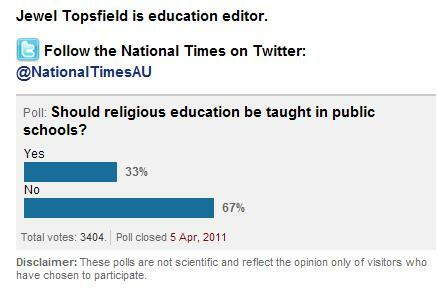 Fairfax also included an on line poll to get feedback on what readers feel about “Religious Education”. 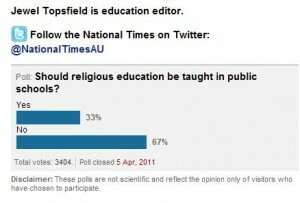 The wording of this poll can be taken to mean different things – but one of the issues that parents have made clear to us is that children should be taught about religion – not instructed in religion. The current system of “Special Religious Instruction” (SRI) is not “Religious Education” – it is “Religious Instruction”. The system is set up to favor ACCESS MINISTRY, which state’s clearly that it uses this vehicle to “reach children” with the gospel message – and teach a curriculum which is not “about” religion – but a program of instruction. The children are told who God is, how they can learn about God, etc … of course it goes without saying that different religions have different views about this. Every day of the school year, ACCESS ministries CRE teachers are sharing God’s love with over 130,000 young Victorians … CRE teachers are introducing young Victorians to Jesus, the Bible and the spiritual dimensions of life. This is not an “educational” project that is going on, it is “missionary work”. ACCESS is very fond of saying that it is about the “spiritual dimensions of life” – but this is just politically correct language, this is about one particular religion’s view of “spirituality”. Religious education would be a curriculum that talked about the different religious and ethical traditions. 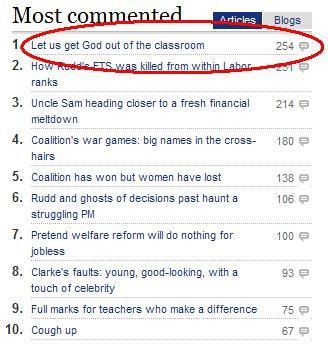 The headline that the AGE ran, would have been clearer if it had said, “Let us get Missionary Organizations out of the classroom”. 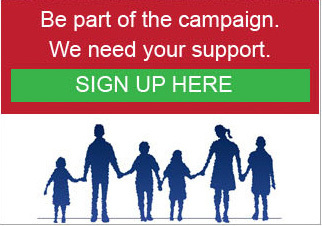 We’ve heard from many, many, parents that we should have “religious education” and that that education should be fair and balanced and inform children about ALL religious traditions and encourage children to think in an inquiry based way about religion and its various expressions. What we have now is “Religious Instruction” designed by and enforced by “believers” rather than “educators”. It is a subtle concept – but an important one.